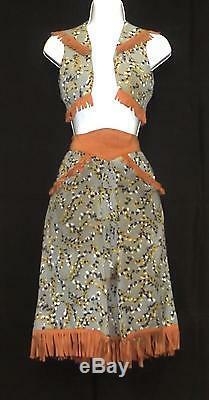 WESTERN FRONTIER PRAIRIE OLD WEST PERIOD COWGIRL OUTFIT BOLO VEST AND SKIRT. WE SPECIALIZE IN OLDER VINTAGE MOVIE WARDROBE AND HAVE OVER 200,000 REAL MOVIE WORN ITEMS IN CURRENT INVENTORY! 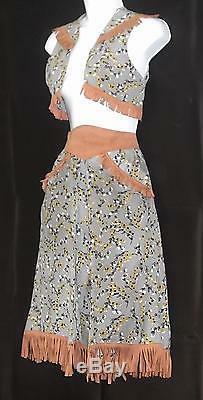 This is a darling Period Cowgirl Skirt with Bolo Vest we are offering! 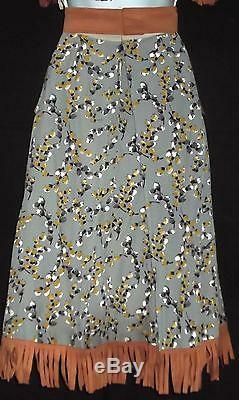 It is done in a beautiful gray silk crepe with a pussywillow design. 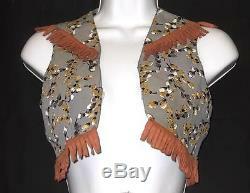 The little bolo vest has brown faux suede fringe on the shoulders, across the back yoke and around the hem. It is lined in a light blue/gray cotton. 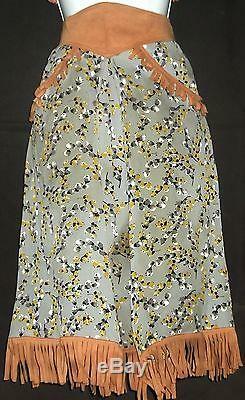 The skirt has a deep (or wide) center pleat at the waist with a set on pointed waistband attached. There are two side front pockets with the faux suede fringe as you can see and fringe around the entire hem. 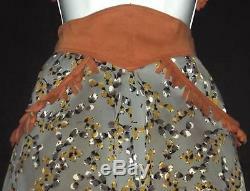 The skirt fastens with a metal zipper and hooks and eyes at the waistband. It is fully lined in the blue/gray cotton. Neither the vest or skirt have labels - they were removed - but they both still have their Paramount cleaning tags attached. This is a custom skirt - it measures APPROXIMATELY a 22"/23" waist and is 26" in length to the bottom of the fringe; 23" to the material hem. The little bolo vest measures about 14 1/2 laying flat pit to pit, but remember it would be worn open. Please keep in mind the age of this outfit! This is a beautiful collectable and needs to be seen to be appreciated. 99% of the time, with good communications almost any problem can be solved. Please keep in mind we sell Hollywood Wardrobe that is collectable. Please remember Communication is EVERYTHING because we will bend over backwards to help our valued customers. 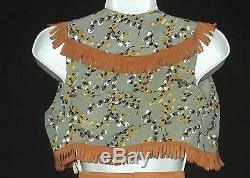 The item "1940s 1950s WESTERN FRONTIER PERIOD COWGIRL OUTFIT BOLO VEST & SKIRT GENE & ROY" is in sale since Monday, October 24, 2016.